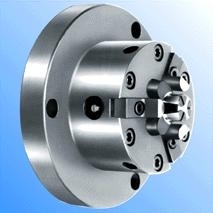 Securely draws the workpiece into the stopper and accurately clamps it without horizontal deviations. Offers as high as 0.01 TIR of chucking repeatability. Is best suited for auto-loaders because of the large unclamping motion. Enhances the cutting force withpower - ful ID chucking.